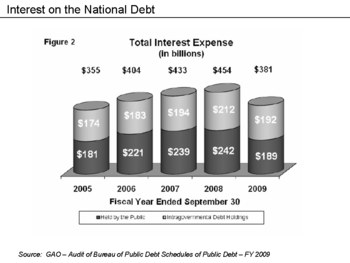 Debt interest payments are the amount the government need to pay to holders of government bonds. 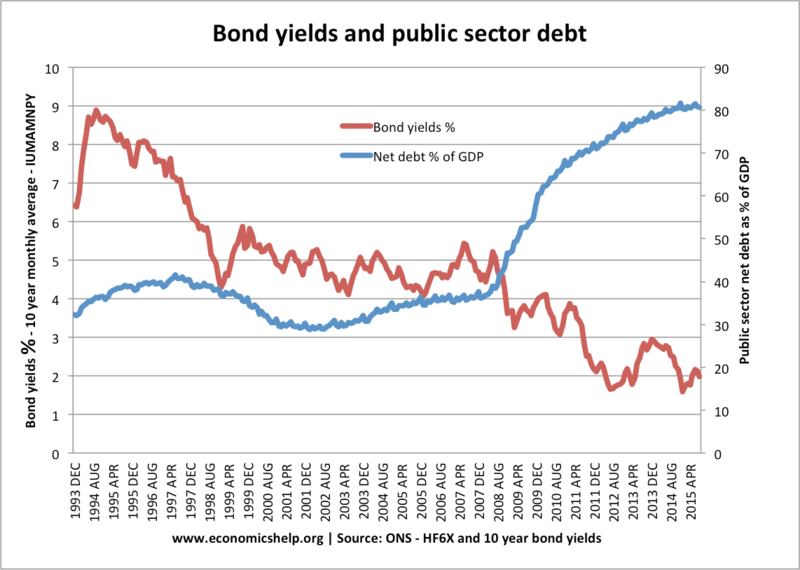 It is the cost of servicing public sector debt. Outstanding levels of government debt. In 2017, UK national debt was £1,737 billion equivalent to 86.5% of GDP. Inflation – A higher inflation rate will lead to an increased cost of index-linked gilts (bonds where interest payments are directly linked to the inflation rate.) Higher inflation will also put upward pressure on interest rates. 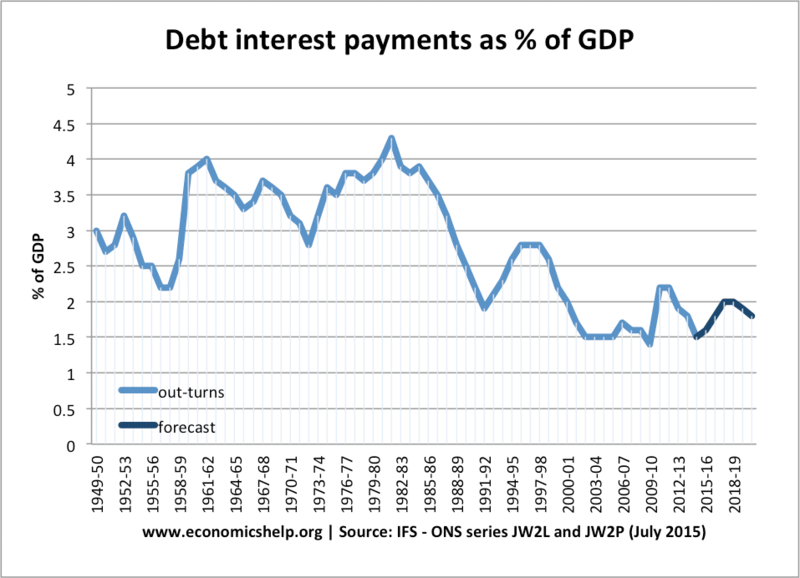 This shows that debt interest payments have averaged around 2-3% of GDP since the 1950s. Debt interest payments fell to just 1.5% of GDP during the great moderation (2000 to 2007) due to falling debt to GDP and low interest rates. 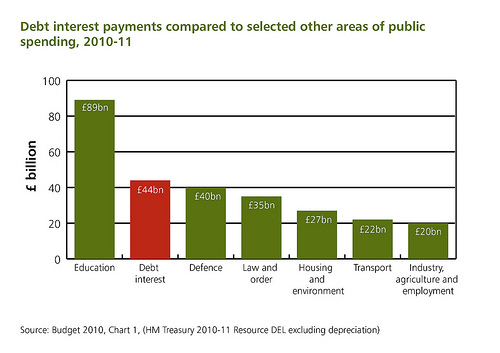 Debt interest payments compared to other areas of public spending. 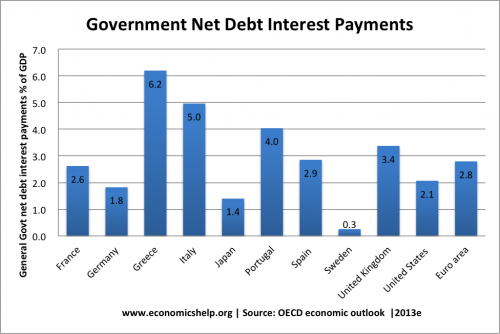 What determines the amount of debt interest payments? The interest rate is determined by the demand for government bonds. If demand for buying government debt falls, the price of bonds rises, pushing up bond yields, increasing the cost of borrowing. Some European countries like Ireland and Italy have seen rapid increases in bond yields, making it very expensive to service the debt. This is because markets worry about their ability to repay debt. 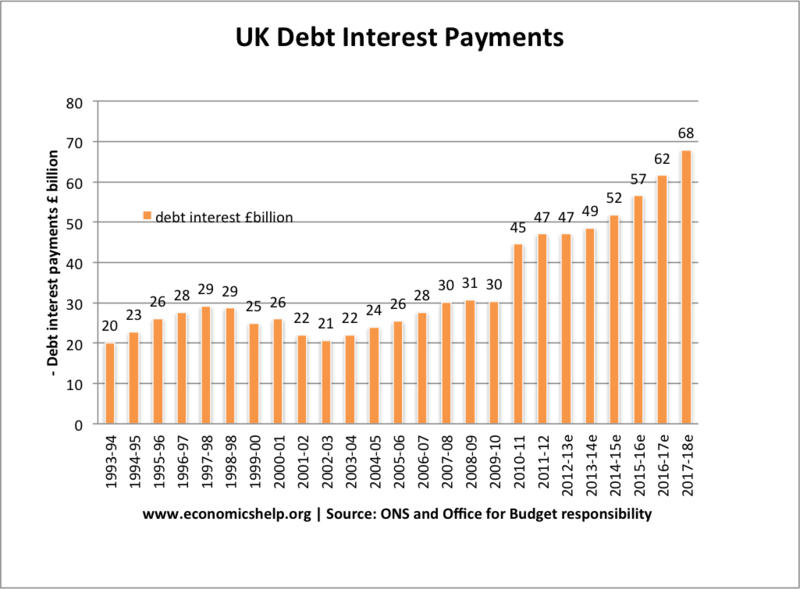 Between 2008-17 – the UK has seen a rise in debt levels, but interest rates have actually fallen. During the great recession (2008-15) Higher debt in UK led to lower bond yields. For example, the US saw a fall in the cost of servicing its debt in 2009 because bond yields fell, despite a growth in US Debt. Note: There is some inconsistency in data depending on the source. 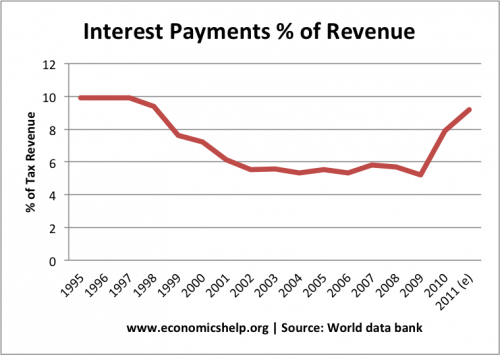 This is because forecasts of future debt interest payments may not be accurate.